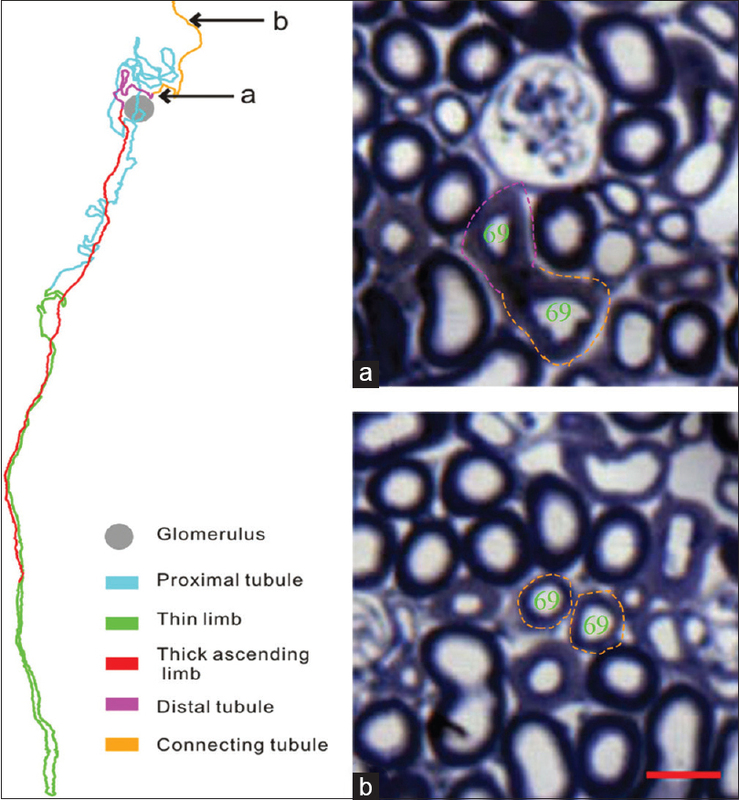 Background and Objectives: In this study, the spatial courses of the connecting tubule (CNT) of nephron from different depth of cortex and the collecting duct (CD) in mouse kidney was established with the aid of three-dimensional visualization technology. Subjects and Methods: Kidneys from three C57/BL/6J mice were removed after perfusion fixation. The tissue blocks were cut perpendicular to the longitudinal axis of the kidney and embedded in Epon-812. A total of 2000, 2.5-μm-thick consecutive sections were obtained from the renal capsule to papilla. After acquiring the digitalized images and alignment, the CNT from 137 nephrons were traced with the custom-made programs. The spatial arrangement of the CNT was visualized, and the length was measured. Results: Each CD received CNT from 5 to 7 nephrons. The CNT from different level of cortex all drained into the CD at superficial cortex but took different path. The CNT from superficial cortical nephron joined CD directly, while the CNT from middle and juxtamedullary cortical nephron joined each other to form an arcade, and the latter drained into CD at superficial cortex. The length of the arcade ranged 400–800 μm. Conclusions: The CNT joined CD at superficial cortex, which means the fluid along the CD from the cortex would not be added from outside, contributing to stabilization of the hormone regulation in the transportation of solutes and water along the CD from cortex to medulla. Reabsorption of the ultrafiltration in the kidney is achieved by delicate spatial arrangement of the tubules of millions of nephrons and their epithelial transportation of ions and water, as well as vessels in close contact with the tubules, which has been reconstructed using computer-assisted tubular tracing technique. The filtration will be then conveyed from the last segment of the nephron into the collecting duct (CD) through a transitional segment and connecting tubule (CNT). Although a minor fraction of the filtration is absorbed in CNT, the segment plays an important role in regulating the ions, water, and acid-base balance of the body due to its accurate control on the multiple transporters by various hormones., Furthermore, recent studies also report a spatial relation of the CNT with vessels, which has been demonstrated to involve in the function of the renin–angiotensin system, therefore, to regulate the blood pressure of the body.,, The spatial arrangement and the length of the tubule will also reflect the morphological formation of the tubule, which have not been elucidated completely. Mouse is a species that is one of the most often used animal models for gene manipulation. Previously, we established the course of nephron tubules and CD in space, measured their parameters such as tubular length, as well as diameter, volume, and surface area of the glomeruli based on tubular tracing. The present study will supplement the information on the spatial arrangement and the length of the CNT based on the previous work and materials on three-dimensional (3D) reconstruction of the nephron with 3D visualization techniques. The kidneys from three C57/BL/6J mice, weight 25 g, were fixed by retrograde perfusion through abdominal aorta with 1% glutaraldehyde in 0.06 M sodium cacodylate buffer and 4% hydroxyethyl starch, pH 7.4. Tissue blocks were cut perpendicular to the longitudinal axis of the kidney, postfixed in 1% OsO4 for 1 h, dehydrated in gradient alcohol and ethanol, and embedded in Epon 812. From each kidney, a total of 2 000, 2.5-μm-thick consecutive sections were obtained from the renal capsule to the papilla using a Reichert Ultracut S microtome (Reichert, Vienna, Austria) and a Diatome histo knife (Diatome, Biel, Switzerland). 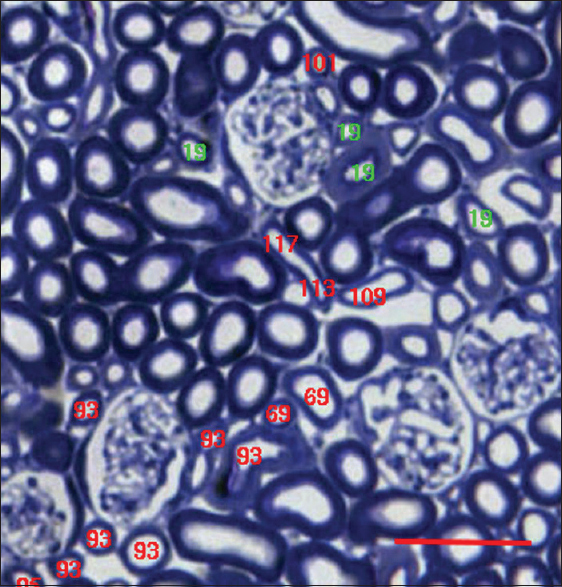 The sections were stained by toluidine blue to obtain the microstructure of renal tissue. Every second, consecutive section was digitized by “PC-Microscope-Digital Camera” image acquisition system (Olympus AX 70 Microscope, Tokyo, Japan; Olympus DP 50 Digital Camera), four partly overlapping digital images from each section were registered and stitched into one 24-bit color image using analysis (Version 3.2; Soft Imaging System, Muster, Germany). The final image size was 2596 × 1889 pixels, with the isotropic pixel size of 1.16 μm. The digitized images were aligned by a previously established alignment algorithm., Each color, image was split into grayscale images (−r,−g, and −b). The difference between two adjacent images was defined as the average distance in RGB space between the pixel values in the two images. In short, a series of relative transformation values were worked out by comparing the pixel values of corresponding points between the adjacent images and then summarized into a set of absolute transformation values. These absolute values underwent high-pass filtration to avoid the risk of accumulated local minimum “trends.” Then, the grayscale images were “moved” according to these absolute transformation values. Finally, the moved −r,−g, and −b grayscale images were merged to form a set of transformed color images.,, With respect to the quality, the improper pairs of the images were corrected by running the aligning procedure iteratively with a new set of initial conditions until the alignment converted into a global optimum. The aligned consecutive images are shown in [Figure 1]. Tubular tracing was performed on a Linux-based computer with custom-made computer programs and by manually placing numbers as markers in the lumen of the tubule [Figure 2]. Each marker corresponded to an x−, y−, and z-coordinates. A set of coordinates depicting the course of the tubules were automatically recorded in a data file, which can be inputted into a rotatable 3D plot for visualizing the tubules in space. The transition from distal convoluted tubule (DCT) to CNT was identified from the microstructure in the digital images. A total of 137 DCT-CNT from three mouse kidneys were traced. Of which, 10 DCT-CNT were chosen randomly from each of three different cortical levels of each kidney for tracing, and 70 DCT-CNT were chosen for tracing based on 12 CDs. Nephron tracing started at the urinary pole of a renal corpuscle, ended at the meeting of the CNT with another CNT or the CD. The CD was traced from superficial cortex to inner medulla. The tracing was conducted among CD “family,” which was defined as a CD and the nephrons that drain into the CD by the CNTs at the superficial cortical level. In total, 137 DCT-CNT from three mouse kidneys were traced. Of which, 10 DCT-CNT were chosen randomly from each of three different cortical levels of each kidney for tracing, and 70 DCT-CNT were chosen for tracing based on 12 CDs. In the present study, we defined nephrons arbitrarily according to the location of their glomeruli in the cortex, as superficial, middle, and juxtamedullary nephron (SN, MN, and JN), corresponding to the outer 30%, middle 30%, and inner 40% of the cortex. As shown in [Figure 3], the DCT cells intermingled with intercalated cells at the late part of the DCT and the initial part of the CNT. Compared with the DCT, the CNT was characterized by thinner wall, larger lumen, and a hybrid epithelium and multiple morphology, i.e., more cellular types intermingled, DCT cells, intercalated cells, principal cells, and CNT cells. Of these cells, the CNT cells, the segment-specific cells, were lower in height with their nuclei centrally located. One of three types of the intercalated cells had their top bulged to the lumen, while the DCT cells had their nucleus located at the apical part of the cell. The CNT ran within cortical labyrinth and ended at the meeting of the CNT with another CNT or arcade or CD at superficial cortex. As shown in [Figure 4], CNT of the nephrons from three cortical levels took different spatial course. The CNT from superficial cortical nephron ran beneath the capsule for a distance before joining a CD directly. The CNT of the JN ascended from juxtamedullary cortex within cortical labyrinth toward the superficial cortex to form an arcade before joining a CD, while the CNT of MN then joined the arcade first. In addition, CNT was often observed to run in close accompany with interlobular vein and to have close contacts with their own afferent arterioles. A total of 12 CD families were traced. According to the tracing, each CD ran in medullary ray inward to the medulla, receiving 5 to 7 CNT of nephrons in superficial cortex, of which one to two were long-looped nephrons, and three to six were short-looped nephrons. The length of the CNT of the nephrons from different cortical depth varied greatly. The length of CNT of the SN and MN ranged 150–650 μm while that of the JN measured 400–900 μm. An arcade between two adjacent CNT was 400–800 μm. The traditional research method for 3D reconstruction of the organ is based on consecutive histological sections and subsequent photographing of thousands of sections, which is time- and labor-consuming, therefore, often compromised with decreasing number of the sections, leading to quality and quantity reduction in reconstructed structure. In the present study, with the aid of “PC-Microscope-Digital Camera” image recording and processing system, the images were acquired and aligned efficiently and reliably with custom-made programs, provided detailed information on the tubule course and length and relations with surrounding tubules and vessels. For the further functional study, the present method also supplies the precise localization of the transporters and even ultrastructure along the traced tubules. The present study found that the segment transitions between CNT and the neighboring segments, i.e., DCT and CD were cytologically gradual because of the multiple types of the cells intermingled along these segments, which was formed by the morphogenesis of CNT during kidney development. The morphogenesis of CNT was initiated by the break of the distal tubule cells of S-shaped nephron into the terminal tip of the ureteric bud branching, i.e., the CD epithelium in adult, suggesting that the invasion of cells from the distal nephron led to the interdigitation of DCT cells with other cells in the initial CNT epithelium. While, as the nephron gets mature, the terminal tip become part of the CNT, consisting of the epithelial cellular components of ureteric bud (CD in adult), i.e., intercalated and principal cells. The lengths of CNT from SN, MN, and JN varied largely, which is related to the successive nephrogenesis at the nephrogenic zone during kidney development. This is also reflected by the distribution of the nephron glomeruli in cortex in a proceeding order with the nephrogenesis, i.e., the first formed glomeruli are located in the juxtamedullary cortex, while the latest formed nephrons are located in the outermost of the cortex. Therefore, the formation of CNT from MN and JN was earlier than the CNT from SN, which may help the CNT joining each other to form the arcade. With respect to the CNT formation of arcades, the mouse has been supposed to be similar to rabbit, guinea pig, rat, and pig, in which all the CNTs drain into the CD through arcade except that from SN. In human and psammomys obesus, only the CNT of the juxtamedullary nephrons form arcade.,, The formation of arcades in the cortical labyrinth, which probably means the fluid along the CD from the cortex would not be added from outside, contributing to stabilization of the hormone regulation in transportation of solutes and water along the CD from cortex. In addition, the present study found that the CNT from SN, MN, and JN joined CD at the middle to superficial cortex. Both the CNT and CD are the segments where the reabsorption of solute and water are aldosterone dependent because of the cellular distribution of abundant mineralocorticoid receptor., The CD is the last segment of the kidney for reabsorbing water and solutes such as Na +, K +, and H +; therefore, it is the last segment for regulating properly the body volume and acid-base balance. The rate-limiting factor for transepithelial transportation of Na + in the CNT, and CD is the activity and the abundance of epithelial sodium channel (ENaC). The activity of ENaC is positively correlated with the level of plasma aldosterone and negatively correlated with sodium intake in diet. The CNT express more ENaC for reabsorbing enough sodium to compensate for a low sodium diet (0.05%). ENaC-mediated sodium reabsorption is coupled with a fixed ratio with K + secretion through renal outer medullary potassium channel to secret K + into the tubular fluid. However, the proton secretion by the intercalated cells through H-K-ATPase coupled with K + reabsorption. The main factors regulating the K + secretion are dietary K + intake and aldosterone. Therefore, the CNT plays important role in transporting ions, water, and regulating acid-base balance of the body owe to its accurate control on the multiple transporters. In summary, with the aid of the 3D visualization technique, the present study established the spatial arrangement of CNT of the nephrons from different cortical depth and the CD in mouse kidney and obtained the length data. The results reflect the adaptation of the structure with function and provide important morphological evidence for the further study of urine concentration mechanisms. We are thankful to Arne Andreasen and Jesper Skovhus Thomsen, for the computer technique assistant of image alignment and tubular tracing programs, and Inger B. Kristoffersen for excellent serial sectioning, Department of Biomedicine – Anatomy, Aarhus University, Denmark. This research was financially supported by National Natural Science Foundation of China Grant No. 31371219. Zhai XY. Three-dimensional reconstruction of the mouse nephron. J Am Soc Nephrol 2005;17:77-88. Loffing J, Korbmacher C. Regulated sodium transport in the renal connecting tubule (CNT) via the epithelial sodium channel (ENaC). Pflugers Arch 2009;458:111-35. Meneton P, Loffing J, Warnock DG. Sodium and potassium handling by the aldosterone-sensitive distal nephron: The pivotal role of the distal and connecting tubule. Am J Physiol Renal Physiol 2004;287:F593-601. Ren Y, Garvin JL, Liu R, Carretero OA. Crosstalk between the connecting tubule and the afferent arteriole regulates renal microcirculation. Kidney Int 2007;71:1116-21. Ren Y, D'Ambrosio MA, Garvin JL, Carretero OA. Angiotensin II enhances connecting tubule glomerular feedback. Hypertension 2010;56:636-42. Ren Y, D'Ambrosio MA, Wang H, Peterson EL, Garvin JL, Carretero OA. Mechanisms of angiotensin II-enhanced connecting tubule glomerular feedback. Am J Physiol Renal Physiol 2012;303:F259-65. Letts RF, Zhai XY, Bhikha C, Grann BL, Blom NB, Thomsen JS, et al. Nephron morphometry in mice and rats using tomographic microscopy. Am J Physiol Renal Physiol 2017;312:F210-29. Song XF, Ren H, Andreasen A, Thomsen JS, Zhai XY. 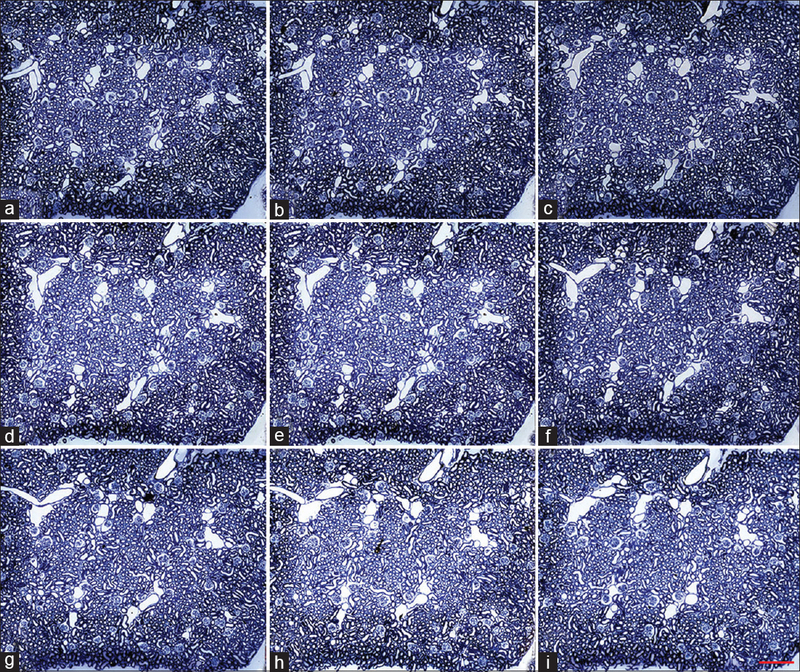 Expression of bcl-2 and Bax in mouse renal tubules during kidney development. PLoS One 2012;7:e32771. Ren H, Gu L, Andreasen A, Thomsen JS, Cao L, Christensen EI, et al. Spatial organization of the vascular bundle and the interbundle region: Three-dimensional reconstruction at the inner stripe of the outer medulla in the mouse kidney. Am J Physiol Renal Physiol 2014;306:F321-6. Molvaer RK, Andreasen A, Heegaard S, Thomsen JS, Hjortdal J, Urbak SF, et al. Interactive 3D computer model of the human corneolimbal region: Crypts, projections and stem cells. Acta Ophthalmol 2013;91:457-62. Bhikha C, Andreasen A, Christensen EI, Letts RF, Pantanowitz A, Rubin DM, et al. Towards automated three-dimensional tracking of nephrons through stacked histological image sets. Comput Math Methods Med 2015;2015:545809. Kao RM, Vasilyev A, Miyawaki A, Drummond IA, McMahon AP. Invasion of distal nephron precursors associates with tubular interconnection during nephrogenesis. J Am Soc Nephrol 2012;23:1682-90. Skorecki K. Brenner and rector's the kidney. J Am Med Assoc 2015;277:346. Kaissling B. Ultrastructural organization of the transition from the distal nephron to the collecting duct in the desert rodent Psammomys obesus. Cell Tissue Res 1980;212:475-95. 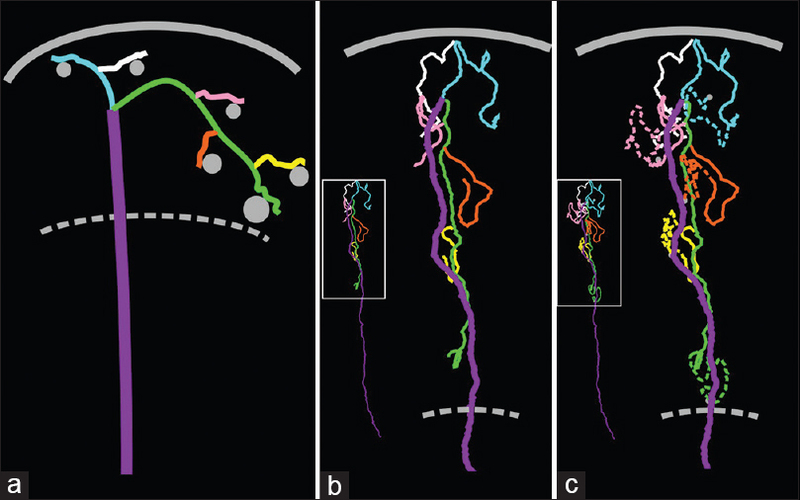 Christensen EI, Grann B, Kristoffersen IB, Skriver E, Thomsen JS, Andreasen A. Three-dimensional reconstruction of the rat nephron. Am J Physiol Renal Physiol 2014;306:F664-71. Bostanjoglo M, Reeves WB, Reilly RF, Velázquez H, Robertson N, Litwack G, et al. 11Beta-hydroxysteroid dehydrogenase, mineralocorticoid receptor, and thiazide-sensitive Na-cl cotransporter expression by distal tubules. J Am Soc Nephrol 1998;9:1347-58. Subramanya AR, Ellison DH. Distal convoluted tubule. Clin J Am Soc Nephrol 2014;9:2147-63. Frassetto L, Morris RC Jr., Sellmeyer DE, Todd K, Sebastian A. Diet, evolution and aging – The pathophysiologic effects of the post-agricultural inversion of the potassium-to-sodium and base-to-chloride ratios in the human diet. Eur J Nutr 2001;40:200-13. Kovacikova J, Winter C, Loffing-Cueni D, Loffing J, Finberg KE, Lifton RP, et al. The connecting tubule is the main site of the furosemide-induced urinary acidification by the vacuolar H+-ATPase. Kidney Int 2006;70:1706-16.